Hiking a 14er is one of those things people claim is quintessential Colorado. It’s no easy feat, even the “easier” mountains. However with a good attitude, good weather, and a little will power you’ll make it to the summit. Below is a mega-list of tips and tricks to hiking your first Colorado 14er. First, it is important to understand that climbing any mountain is risky business. People die every year on Colorado’s 14ers. It isn’t that these mountains shouldn’t be hiked, in fact, some of the best hikes in Colorado are hiking a 14er, but do be sure to be prepared and understand what you are getting into. This isn’t an ordinary hike, but you aren’t climbing Mount Everest either. These tips for hiking a Colorado 14er are designed to get you prepared and organized for your big adventure. When is the Best Time to Hike a Colorado 14er? Colorado’s 14ers can be hiked and climbed year-round. However, you shouldn’t attempt to hike in winter or during adverse conditions until you have plenty of experience not only in the mountains but also dealing with winter conditions such as avalanche terrain and long, snow-filled approaches. 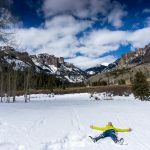 Most trailheads to Colorado’s 14ers are inaccessible during the winter months, meaning that you’re hiking distance will be substantially increased and conditions. Trails can get snowed in as early as October and typically winter conditions will last until late July. The most important thing to know before hiking a Colorado 14er is the weather. It is extremely dangerous to be on any peak when there is a risk of storms. Think about it. Lightning strikes the highest point. When you are on a mountain there are no trees to protect you. You become the highest point in a field of rocks. Therefore, you want to be below treeline well before a storm. During the summer months, storms roll in quickly and strike without warning. Know the weather before you go and check the National Weather Service. You can get pinpoint weather by entering the peak name in the search bar (be sure to double check the map to make sure you’re in the correct location). Next, examine the hourly weather charts on the right of the written weather descriptions. You can click on those and get up-to-date info on storm predictions, wind speeds, temperatures and more. If the storm threat is real, stay home. A good rule of thumb is to plan to be off of the summit before noon. Take note of which direction you are hiking, keeping in mind that weather patterns in Colorado tend to move from west to east. Sometimes clouds can be building beyond the summit and you can’t see them. I take this tip one step further and aim to be at tree line (where the trees start to grow again) by noon. If you’ve never climbed a mountain before, it is unsafe (and unrealistic) to think that you should march up Capitol Peak or Long’s Peak. Those mountains take a tremendous amount of effort and skill to climb. Sure, the photos look great, but those Colorado 14ers are not for beginners. Instead, pick a peak that is better suited for your ability. Keep the altitude in mind. Hiking 12 miles in the Colorado Rockies is not comparable to hiking 12 miles on the east coast. Your body works harder at altitude, so if it’s your first time hiking high, tone down the mileage to increase your chance at success. Pick a Colorado 14er that is either a Class 1 or Class 2 mountain for your first Colorado 14er. These peaks will give you a good feel for the effort it takes to hike a big peak, but don’t require any special gear or skills. Stay away from Class 3, 4 or 5 routes until you have some experience under your belt. Let’s take an example. Mt Bierstadt is a seven-mile hike with 2,850 feet of gain. If you look at a topographical map, you’ll see that the first mile and a half of the hike are relatively mellow, with little gain. That portion should take the average hiker around 45 minutes. Then the next two miles are fairly steep, with plenty of switchbacks and grueling elevation gains. Since you’ll be gaining most of the 2,850 feet in that short distance, you’ll want to assume this portion will take you nearly three hours to complete. Factor in a few extra breaks and time for some summit selfies and you’re looking at an estimated four and a half hours until you reach the summit. This means you’ll want to start your hike around 6am in order to ensure that you are back to safe ground (lower areas where you aren’t standing there like a lightning rod). Climbing and hiking any mountain isn’t always cut and dry. Things pop up, you get off-route, you take extra breaks, the altitude weighs you down, any number of things can happen. In order to ensure you stay safe and don’t get too carried away with summit dreams, set a turn around time before you even leave for the trailhead. Decide on a time by which if you do not make it to the top, you turn around, no matter what! Summits are deceiving, and often times you can look like you’re close, but be a far ways away. Always stick to your turn around time in the mountains so you don’t get caught in a storm or end up spending the night in the alpine unprepared. Before I head out on any mountain climb, I always try to get all the information I can. Hiking a Colorado 14er has the added bonus of having tons of resources at your fingertips. 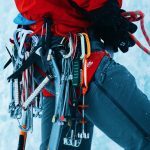 14ers.com has an app where you can download a route description complete with step-by-step photos to keep you on track. Remember to download your specific route to your phone before you hit the trail. Also, be sure to use a GPS app to map out your route and have it available for your big hike. Lastly, always carry a paper backup, since batteries die! Next, train for your first Colorado 14er. Start a training program eight weeks before your big 14er hike. Carve out an hour, three times a week to get on a treadmill or Stairmaster with a weighted pack. You’ll also want to do plenty of squats and lunges so you’ll have strong hips and hammies for the descent. For my first 14er, I hiked Mt Bierstadt without gloves. That was utterly stupid. Temperatures at the summit were near freezing and the wind was blowing at 40+MPH. It was a miserable experience for my hands. People aren’t normally thinking about cold weather things in the middle of July – I certainly wasn’t. Dress in layers (don’t wear cotton), wear appropriate footwear built to handle the terrain, bring sun protection, snacks, plenty of water, moleskin for blisters, and definitely pack a warm hat and gloves. Please pack out your trash to keep the place clean for those after you. For a comprehensive packing list, see my post on what to pack for your mountain climb. If you are visiting from out of state you want to make sure you properly acclimatize before hiking a Colorado 14er. Give yourself a day or two after arriving in Colorado to get used to the thin air. Go on a short training hike a day or two before hiking a 14er and drink plenty of water. Avoid alcohol and let your body adjust to the thin air. Going straight from Denver to above 14,000 feet is a lot to ask of your body, even if you live here. Expect to feel the effects of altitude and plan accordingly. Climbing and hiking mountains is all about the early wake-up calls. 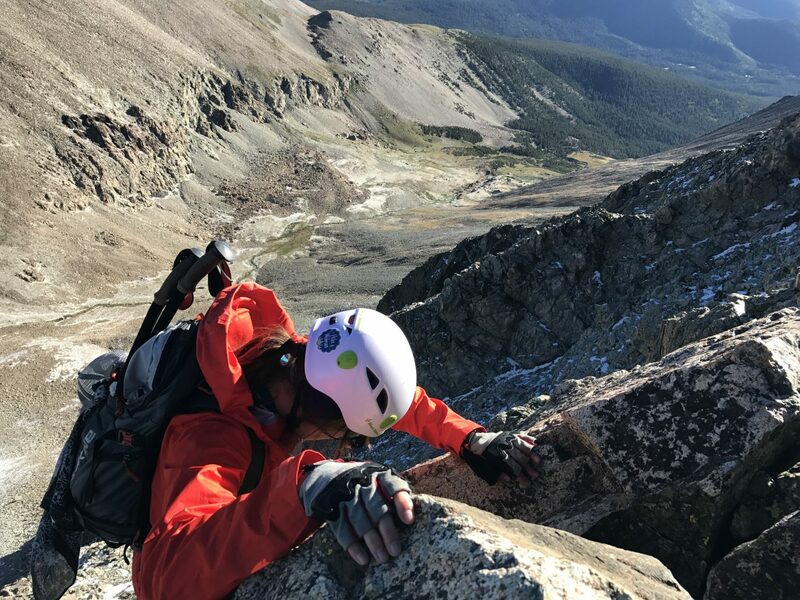 Alpinists both revel and dread that 2 am wake-up call, but it is an essential part of mountaineering, not just hiking 14ers. There are several important reasons to wake up early. The most important one is safety. Simply put, morning is a safer time to be in the mountains. The snow is more stable, storms haven’t rolled in yet, and it’s good practice to start before the sun. Secondly, beginner Colorado 14ers are some of the most popular trailheads in the country. Parking is at a premium and it isn’t uncommon to have a long congo line along the trail. This can be frustrating if you move at a quicker pace or have to constantly stop and wait for people. Typically I’ll time my hike so that I am on the summit for sunrise. It’s a thrilling feeling to see the shadow of the mountain you are standing on dominating the landscape. So set that early alarm and get up early to enjoy the alpenglow. You can nap when you get home. One big mistake new mountaineers make is trying to go for the all-time Strava record. Slow down. Take your time. The air is thin up there and it’s totally normal to go at a slower pace. If you’re struggling physically slow down. Don’t go for the fastest time. The point is to challenge yourself and enjoy yourself. There have been times on the trail when I’ve been so beat tired and I just tell myself “I can’t.” I’ll stop, catch my breath, get going again and find myself in the same place mentally. To break through those moments I slow my pace down. Everyone has their own way of “tuning in.” I count to five one time for each breath and just repeat. Sometimes my feet are at a mere shuffle but I’m still moving forward. Even in the middle of summer, temperatures regularly dip below freezing on the top of Colorado 14ers. If you’re using your phone for navigation, your batteries will quickly drain. Here are a few quick tips to get the most out of your battery life. Keep your phone in airplane mode with location services turned off. Do both of these things so your phone isn’t searching for satellites or cell towers. You can switch your location services on if you need to check your GPS really quick, but don’t forget to turn it off again. Put your phone on low-power mode if you have it. Carry a small, portable battery pack. Every mountaineer has turned around on a peak or two…or ten. In fact, it is super common not to make it to the summit. I can’t count how many times I’ve had to turn around. Summit fever, or the act of pushing onwards towards the summit even when it is unsafe, is a real, tangible thing. Remember: no mountain is worth your life. Take pride in your botched summits, at least you got outside that day! Part of hiking a 14er is understanding a few navigation tricks. Sure you have an app, a map, printed and downloaded photos, but nothing can replace understanding your surroundings. When you’re in the middle of the uphill grind, it’s easy to get caught up in forward momentum. But don’t forget to stop and take note of what is behind you! This will help you navigate the descent. Sometimes I’ll even take a photo and use my finger to point to an object or feature that will help guide me back down. Hiking a beginner 14er is essentially one grueling activity. It can get tough to keep going when your legs are tired and you are out of breath. One trick to push through the grind is to set small goals for yourself. When it gets extremely tough or I feel like giving up I will find something, maybe a trail marker or a strange looking rock 20-100 feet in front of me and I say to myself “I will walk to that rock.” Suddenly, I’m at that rock and I will pick another. Before you know it you’ve made progress. As with anything in life start small and big things happen. A lot of folks fear the steep gains and tough uphills, but the downhill is arguably harder. In fact, most accidents in mountaineering happen on the descent. You are tired, your body is fatigued, you’ve reached your perceived goal, and you’re no longer fighting gravity. However, a misstep on the downhill can cause a painfully twisted ankle or worse. Many people slip and fall, get lost, or put too much wear and tear on their bodies during the descent. Listen to your body and remember, if you’re too exhausted to continue or you are thinking about pushing through something such as a minor injury, you still have to get back down the mountain. Save energy, focus, and concertation for the downhill. Whenever I reach the summit I congratulate myself for making it halfway. Keep your mental game sharp and take care to hike with the same intention downhill as you did uphill. Bringing your dog on a Colorado 14er is a personal choice. Nina, my 12-year-old adventure mutt has summited a few mountains. However, Class 3 terrain is no place for an animal. People have abandoned their dogs in sketchy situations on Colorado 14ers and it is always a sad story. The rocky terrain can be particularly rough on their paws, so be sure to have paw protection. Also, many of these trails are quite crowded, and you’ll need to keep your pet on a leash. Depending on the route, this can be dangerous for both you and your dog. Keep this in mind when deciding if taking Fido on your 14er hike is right for you. Now you’re armed and ready to hike your first 14er. Colorado 14ers are a state icon, and hiking a 14er is an incredible experience. Be prepared and enjoy the challenge! Such a solid post! Great tips. Thanks Squitter! If there’s anything you’d like to see or know about feel free to let me know. Happy trails! 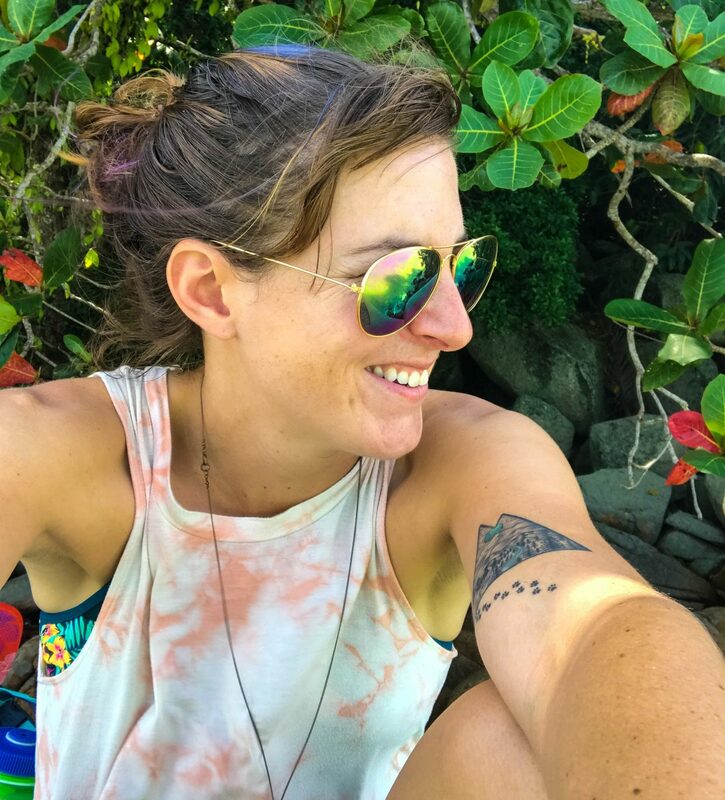 I’ve been wanting to do a 14er for a couple of months now (I met a girl from Colorado and have been heavily influenced by her Instagram, big surprise) and this post was really informative! The pictures are great too. Thanks for this!